You’ve been staring at drab old kitchen walls for far too long. And that dull, cracked tile in your bathroom? It’s gotta go. When a gut renovation is not in the cards but you’re able to splurge on a little more than a fresh coat of paint, try tiling. It’s a small update (well, compared to ripping out your cabinets and starting anew, anyway) that makes a huge difference in any room. It helps that the tile market is saturated with buzzy brands and cool makers to the point where you’re sure to find something that’s perfectly in line with your own style. There’s Popham Design, the Marrakech-based studio responsible for the It tile of 2018. There’s Clé Tiles, which frequently collaborates with artists and designers for artful pieces, and the uber-customizable Artistic Tile. Textile studio Aimee Lacalle just launched its first-ever tile collection. If you’re willing to put in the work for a more independent assembly process, Etsy is a treasure trove of unique, often handmade tiles waiting to be discovered. A quick glance of the #sodomino hashtag over on Instagram tells us we’re not the only ones with tiles on the brain. From clean, minimalist spaces where simple tiling adds just a bit of texture to two-tone bathrooms where tiles bring a pop of color to a tiny space, there’s a lot of style inspiration we’re pulling from our readers—here are some of our favorite tile ideas. This vintage style is a classic for a reason. 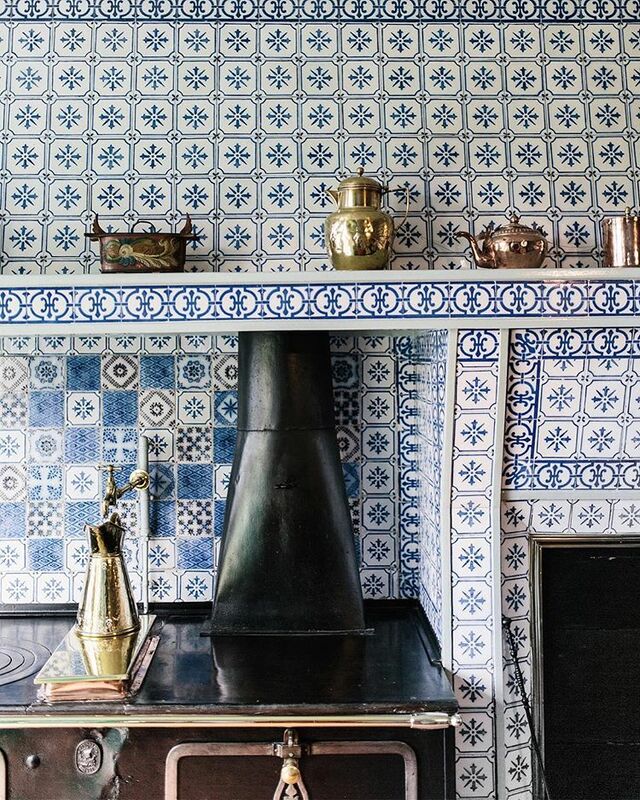 You can’t go wrong with blue and white—just look at the Azulejo tiles from Portugal. For this, pick out something handpainted if possible to really drive home that old-world look. A bold backdrop is the solution for when you want to zhoosh up your kitchen without going all-out. Here, graphic black and white break up an otherwise white-walled kitchen. The black pendants are a nice complementary touch. Proof that two-tone walls aren’t solely restricted to paint. The idea of combining two different sizes (and colors) is such a great one, especially when one colorway is a warm yellow hue. This, friends, is what we call “committing to a theme.” Every wall is covered in subway tiles, and though the floor is a different tile pattern altogether, the fact that it’s white from floor to ceiling really makes this bathroom look cohesive. Green tile really brings this tiny bathroom to life. Having restored the original tilework, these homeowners also updated the floor tile to something more modern that transformed the room to a more contemporary scene. Click through to see the amazing transformation and get inspired for your own DIY. If you’re going to go with red tile, go all-out. Vibrant red subway tile is an unexpected twist on what can feel like a tired trend. Opt for bright colors instead of simple white to make subway tiling look fresh again. Gorgeous tilework from Ann Sacks instantly makes this powder room look more impactful. Plus, tying in the blue of the tiles into the carpet makes a great finishing touch. Don’t neglect your floors. While hardwood is always a safe bet, taking a risk with a printed tile can really pay off—as exhibited by this space here. Go for something in a neutral if you’re not fully sold on patterned floors. The white tiles in the backsplash may be simple, but they’re just the ticket for a calmer, more minimalist space. Tiny squares are a welcome reprieve from subway tiling.